Triads are a combination of three-note. 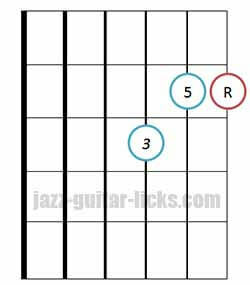 They are generally the first chords to learn for the beginner guitarist. 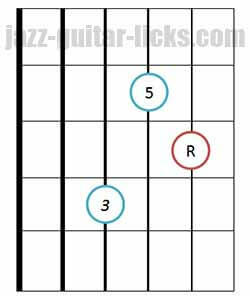 Learning and playing triads on all over the guitar fretboard will expand your musical knowledge and comping skills. Major triads are built of three notes : root - major third and perfect fifth. Minor triads contain a root, a minor third and a perfect fifth. Diminished triads are built with a root, a minor third and a diminished fifth. To build an augmented triad you need a root, a major third and an augmented fifth. Major triad : Generally, no quality symbol is added. Minor triad :"m" or "min". Diminished triad : "dim" or a degree sign "°". Augmented triad : "aug" or a plus sign "+"
Major triads are basically built by stacking the root, the major third and the perfect fifth of the major scale. 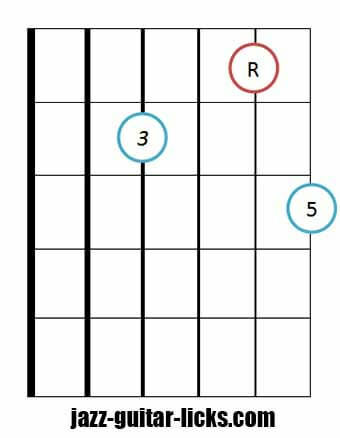 As you can see in the chart below, the C major triad is made up of C (root), E (major third) and G (perfect fifth). 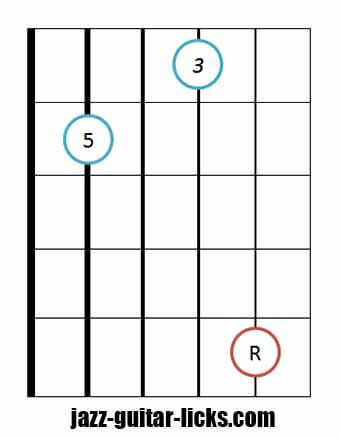 An inverted chord is a chord whose notes are arranged so that a note other than the root is in the lowest voice. In other words, the notes of the chord are in a different order. 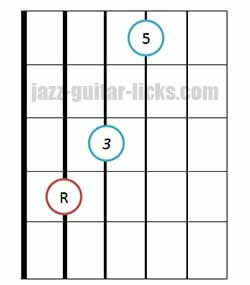 In the following diagrams you will find four root positions related to the third, fourth, fifth and sixth strings. 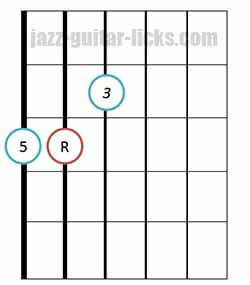 Each root position occurs two inverted chords with the third or the fifth in the bass. 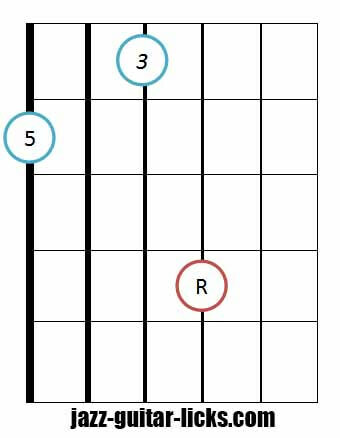 That gives 12 closed positions for one chord. 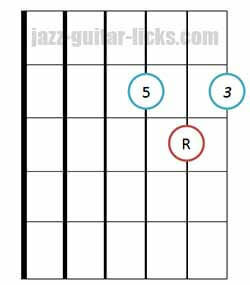 What is a closed chord? 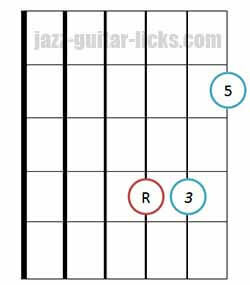 Closed guitar chords are those where the root and the inverted positions, fit within the space of one octave. You have to practice and master these twelve positions in twelve keys. 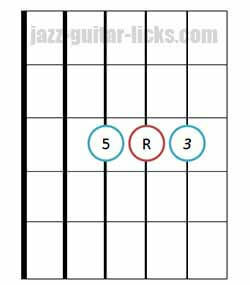 You also have to be able to name each chord that you play. 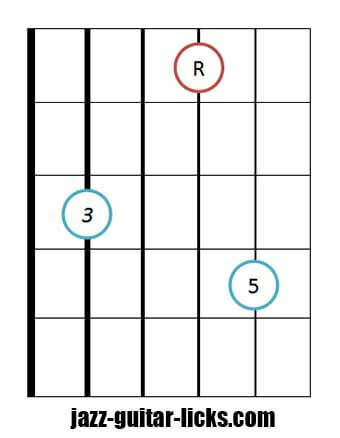 This three guitar diagrams show you three ways to play close voiced major triads with basses on the 6th string. 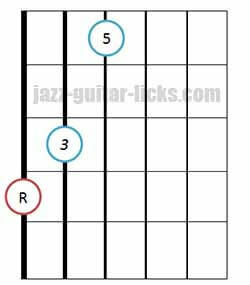 For example, to play the A major chord using the root position, you must place your pinky finger on the sixth string at the fifth fret (root). 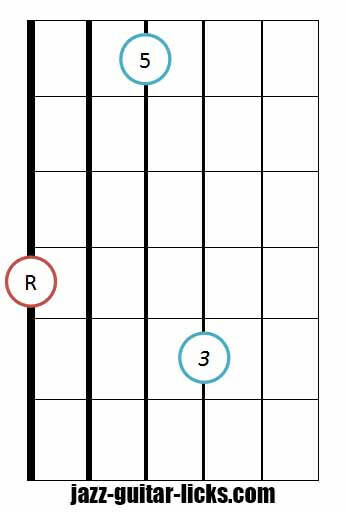 Place the ring finger on the fifth string at the fourth fret (third) and then, the index finger on the fourth string at the second fret (fifth). 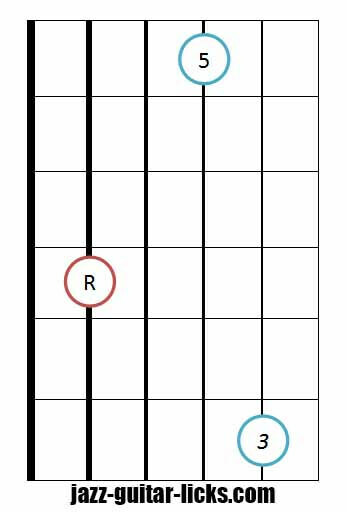 To play the A major chord with the first inverted position (third in the bass) you must put your third finger (ring finger) on the sixth string at the ninth fret, then you only have to bar the fifth and the fourth strings at the seventh fret with the index finger to get the fifth and the root. The second inverted chord is obtained by placing the second finger on the sixth string at the twelfth fret (5), the third finger on the fifth string at the twelfth fret too and the first finger on the fourth string at the eleventh fret. 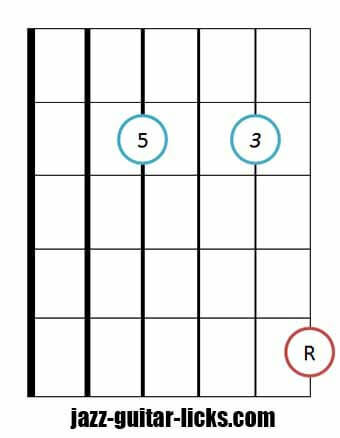 Here are three ways to play close voiced major triads with basses on the 5th string. 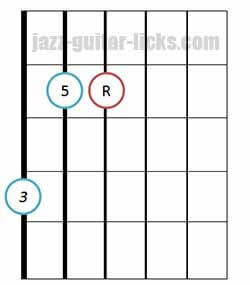 Three ways to play close voiced major triads with basses on the 4th string. 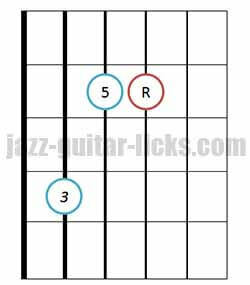 And to finish, three ways to play close voiced major triads with basses on the 3rd string. Since major triads are built with 3 notes, it is possible to drop the second highest note (the middle note) of a major close voiced triad up an octave to produce what will call a drop 2 voicing referred to as open voiced triad. It is a very much appreciated technique by composers and arrangers. 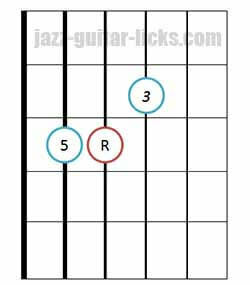 This concept can be applied to any chords as minor, major, diminished and augmented. 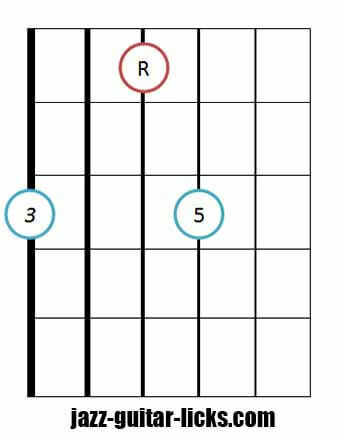 The chart below show you three major open voiced triads in connection with the 9 guitar diagrams below. In bar 2 the second highest note of the first inversion of C major is dropped up an octave. 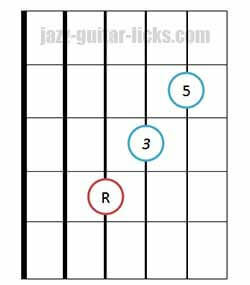 That gives E (third), C (root) and G (fifth), referred to as an open C major chord third in the bass (C/E). As you can see in bar 3 , the second highest note of the second inversion of C major is dropped. Thus giving G (fifth), E (third) and C (root). This is a C major open voiced triad with the fifth in the bass. (C/G).